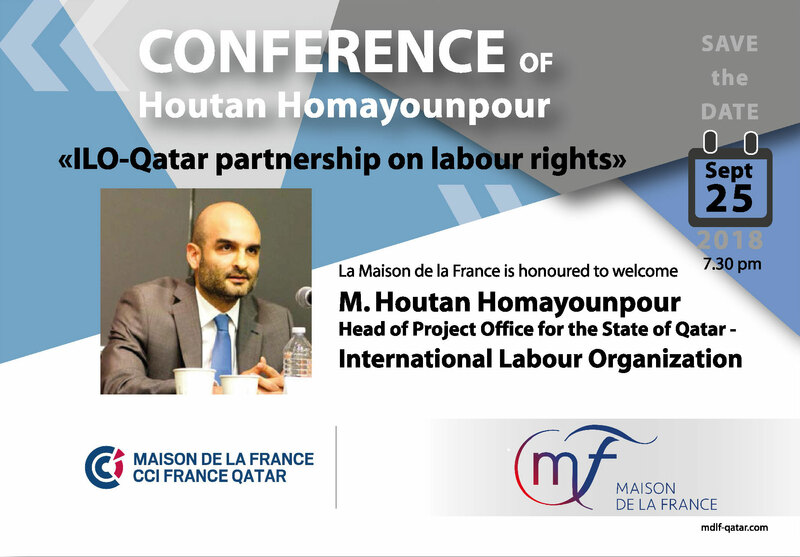 La Maison de la France et la nouvelle Chambre de Commerce et d'Industrie France-Qatar ont le plaisir de vous inviter à la conférence de M.Houtan Homayounpour sur la récente évolution du droit du travail au Qatar, et la collaboration entre le pays et l'Organisation Internationale du Travail (ILO). Nous nous retrouverons à l'Intercontinental City le 25 septembre à 19h30. La conférence sera suivie d'un cocktail élaboré par les nouveaux chefs français de l'hôtel. Inscription avant le 20 septembre 2018. Droit d'entrée : 80 QAR pour les membres et 120 QAR pour les non membres de la Maison de la France. La Maison de la France and the new French Business Council have the pleasure to invite you at Intercontinental City Westbay, 25th of September 2018 from 7.30pm to 9pm. 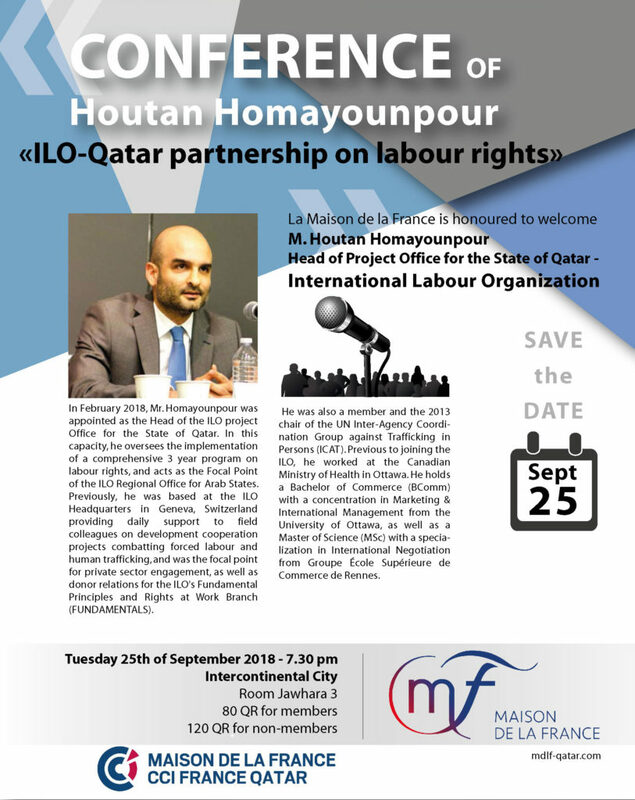 The following presentation: "What's New on Labour Rights in Qatar" will be given by M.Houtan Homayounpour, Head of Project Office for the state of Qatar - International Labour Organization, and followed by a cocktail. Mandatory registration by September 20th, 2018. Fees to be paid upon arrival, QAR 80 for members, QAR 120 for non members. In February 2018, Mr. Homayounpour was appointed as the Head of the ILO project Office for the State of Qatar. In this capacity, he oversees the implementation of a comprehensive 3 year program on labour rights, and acts as the Focal Point of the ILO Regional Office for Arab States. Previously, he was based at the ILO Headquarters in Geneva, Switzerland providing daily support to field colleagues on development cooperation projects combatting forced labour and human trafficking, and was the focal point for private sector engagement, as well as donor relations for the ILO's Fundamental Principles and Rights at Work Branch (FUNDAMENTALS). He was also a member and the 2013 chair of the UN Inter-Agency Coordination Group against Trafficking in Persons (ICAT). Previous to joining the ILO, he worked at the Canadian Ministry of Health in Ottawa. He holds a Bachelor of Commerce (BComm) with a concentration in Marketing & International Management from the University of Ottawa, as well as a Master of Science (MSc) with a specialization in International Negotiation from Groupe École Supérieure de Commerce de Rennes.